2018 Reissue on Black Vinyl - Limited to 100 copies! 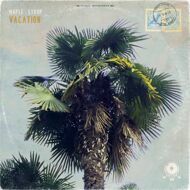 Millenium Jazz Music introduces the “Vacation LP” by Maple Syrup. An album of 16 relaxed lo-fi instrumentals, each of which serves as a part of a little trip with Maple Syrup. Go for a walk down the streets of Malaga. Get a cup of coffee in a Paris cafe. Lay on a beach in San Jose. Get some rest on a plane before keeping the journey going in rainy St. Petersburg, and then find yourself in the mysterious atmosphere of the misty Baikal shore. Just sit back and enjoy the ride on this “vacation”.